The Wheel of the Year Tarot arrived last week. It’s a lovely, charming and bright deck which has an extremely high feel-good factor. However, there is a little striped pattern (see link above) going across the borders of this deck and I found that incredibly distracting. Not being one to normally crop my decks, I decided put this one under the knife even before the new deck interview. 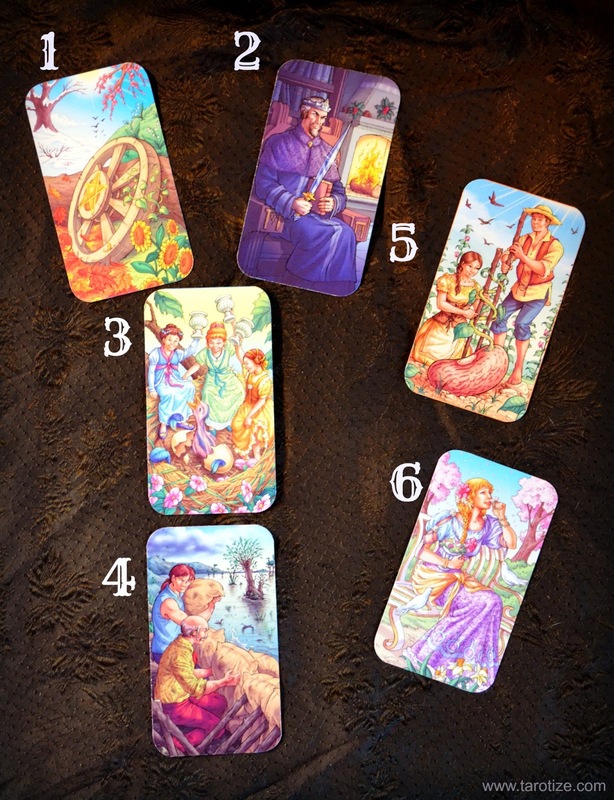 So without further ado… Meet the borderless and utterly fabulous Wheel of the Year Tarot! Me: Well played, Wheel of the Year Tarot, well played. Me: Could that be because you come across as quite cheerful at a glance? WYT: Yeah, that’s right. But there are dark cards too and I am actually quite balanced and well-rounded (pun intended). Me: You crack me up! 4. What do you expect in return? – That you make sure you stay objective. Observe how those men in the 7 of Wands work together to put sandbags up to protect their land from flooding. You are never fighting anything outside yourself (the flood water is your own emotions, just like in dreams about water), so it is paramount that you learn to detach and realise that it is your own emotions you are ‘fighting’ and it is them I reflect back to you. Me: Oh wow, that was a surprisingly deep and insightful answer. Me: Yeah, I got that! Thank you for being with us today and I hope the readers have enjoyed getting to know you a bit better as much as I have! Addendum: I have had this deck for over 18 months now and it is still one of my favourite working decks!